Acosta's pass was temporarily restored Friday by a federal judge's ruling. The Trump White House said in a letter Monday that it is dropping its effort to suspend CNN Chief White House Correspondent Jim Acosta's press pass, but set rules it said if not followed, "may result in suspension or revocation" of a journalist's credentials. "Your hard pass is restored," White House press secretary Sarah Sanders and deputy chief of staff for communications Bill Shine wrote to Acosta. "Should you refuse to follow these rules in the future, we will take action in accordance with the rules," they wrote after outlining the rules. Trump was "aware of this decision and concurs," according to the letter. Following the letter from the White House Monday afternoon, CNN dropped the case in court. "Today the White House fully restored Jim Acosta's press pass. As a result, our lawsuit is no longer necessary. We look forward to continuing to cover the White House," CNN said in a statement. The letter from the White House outlines four rules: a journalist "will ask a single question and then will yield the floor to other journalists," follow-up questions will be permitted "at the discretion of the president or other White House officials taking questions," "yielding the floor" is defined as "physically surrendering" the microphone and, lastly, "failure to abide" by any of the rules may result in "suspension or revocation of the journalist's hard pass." 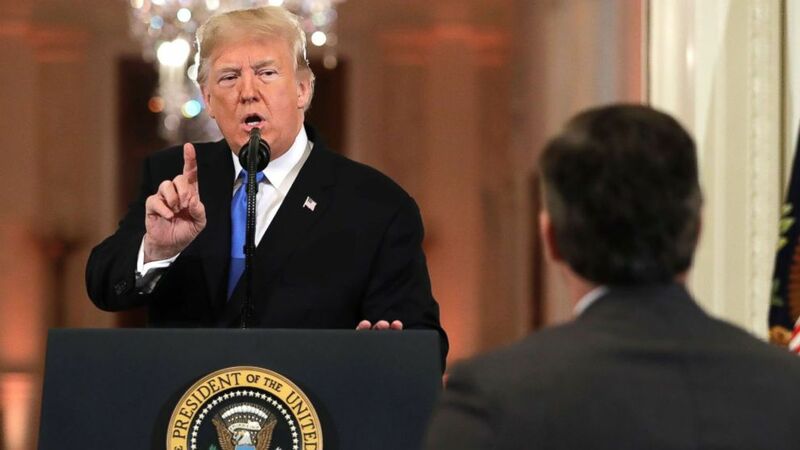 Acosta was stripped of his press pass without warning earlier this month after a heated exchange during a press conference with President Donald Trump one day after the midterm elections. His press pass was temporarily restored by a court order Friday and the judge ordered both legal teams to submit a status report detailing how they would like to proceed by 3 p.m. on Monday. The letter cites “behavior” at a press conference the day after the midterms that “violated the basic standards governing such events” as the reason to suspend Acosta’s pass. It’s signed by Bill Shine, deputy chief of staff for communications, and Sarah Sanders, White House press secretary, who are both named as defendants in the initial lawsuit. In the letter, Acosta wrote that there were "no so-called 'widely understood practices'" governing press conferences, which the White House jumped on in outlining four rules on Monday. CNN filed a lawsuit earlier this week claiming that revoking Acosta's press pass to the White House, known as a "hard pass," violated the First Amendment. White House Correspondents' Association President Olivier Knox issued a statement saying reporters should continue to be allowed to ask follow-up questions. "The White House did the right thing in restoring Jim Acosta's hard pass," the statement said. "The White House Correspondents' Association had no role in crafting any procedures for future press conferences. For as long as there have been White House press conferences, White House reporters have asked follow-up questions. We fully expect this tradition will continue. We will continue to make the case that a free and independent news media plays a vital role in the health of our republic," Knox said. U.S. District Judge Timothy J. Kelly repeatedly emphasized at the court hearing on Friday that his decision to return Acosta's press pass, with a temporary restraining order as litigation continues, was based on the Fifth Amendment, under which the judge ruled Acosta was denied his right to due process. Due process would give Acosta and CNN the chance to rebut and challenge the appropriateness of the government’s action. In his remarks, Kelly made clear that the ruling, which is only the beginning of the court proceedings to decide Acosta’s White House access, was narrow and didn’t determine whether or not Acosta’s First Amendment right was violated.